On Monday, Canadians will head to the polls to vote in the country’s 42nd general election, ending one of the longest election campaigns in Canadian history. We’ve shared some of the technology-related news coming out of the campaign in our Election 2015 Tech Watch updates, and here’s one last round-up before you go to mark an X on your ballot. Remember, voting is our democratic duty – one many around the world fight to gain — so be sure to research all the parties and their policies, and ensure your voice is heard. 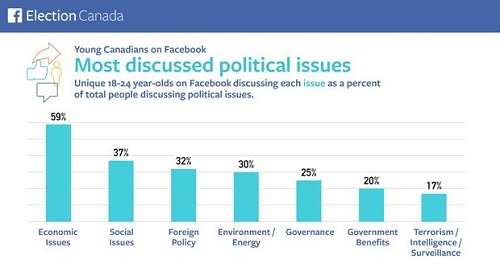 Facebook Canada has shared its “most impactful” posts by the political parties and their leaders, measure both by interactions and, more subjectively, those that were unique or gave Canadians unique access to the leaders. The Facebook top 10 highlighted Stephen Harper’s Facebook Q&A, Justin Trudeau’s platform launch on Facebook and Tom Mulcair’s support for International Beer Day. 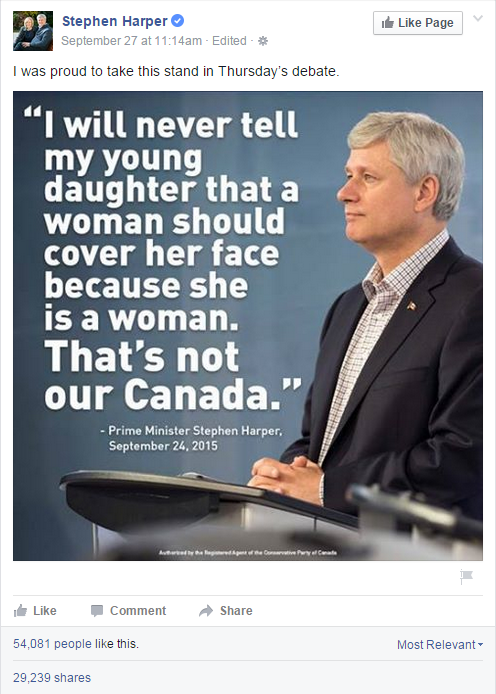 The most interactions, however, were generated by a Harper post stating his opposition to the niqab, generating over 54,000 likes and 29,000 shares. If you’re a data junkie, you may want to check out Esri Canada’s latest story map, which helps members of the public share the results of the last five federal elections through an interactive map interface. Clicking on the map will reveal popups with results, including ballots cast and turnout. What are young voters talking about on social? Facebook set out to answer that as part of its Election Canada analysis. During the period August 2 through October 4, economic issues were on the minds of Canadians aged 18-24, followed by social issues, foreign policy, and energy/the environment. 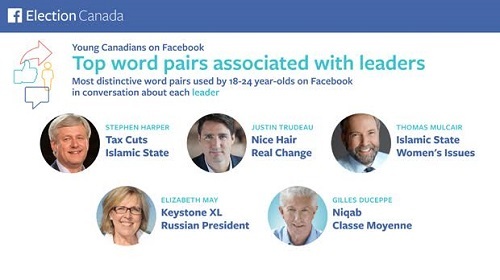 Facebook also charted the top word pairs that younger Canadians tended to use in social conversations about each of the major party leaders.